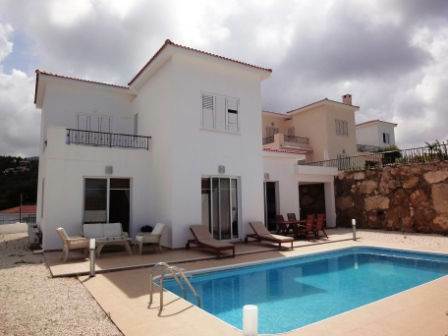 This fully furnished 3 bedroom villa is located on the hills above the popular village of Tala, which has many local amenities, including a lively village square with a good variety of restaurants and tavernas. Paphos is a 10 minute drive away. The ground floor accommodation features a light and airy living room including lounge, dining area and corner kitchen. The kitchen with granite worktops is well equipped with built-in oven, electric hob and extractor fan, fridge freezer, dishwasher and washing machine. Patio doors from the lounge and dining area provide easy access to the outside terrace and pool area. There are three double size bedrooms, all with fitted wardrobes and en-suite shower rooms. One bedroom is on the ground floor and has patio doors leading onto the pool terrace. The master bedroom upstairs has a private balcony with fantastic sea and mountain views. Outside there is a walled garden and pool area with plenty of space for relaxing. To the side are wonderful views of the Kamares mountain region. A long driveway and covered car port provides parking for 3 cars. This property is ideal as a holiday home or for residential use.